Visitors who travel from San Francisco into the Santa Clara Valley can no longer view the vast stretches of orchards and vineyards which once graced this fertile region. 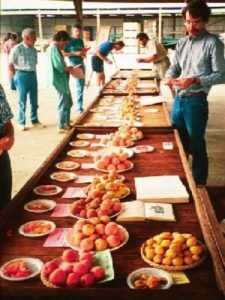 The old farmsteads have given way to Silicon Valley’s high tech industrial parks, strip malls, and housing developments; only a handful of orchards remain to carry on the rich tradition of fruit culture in the valley. Andy’s Orchard isn’t fancy or modern, but we feel it’s a special place where the old art of fruit growing is being practiced with pleasure in much the same manner as it was done many years ago. If you are in the neighborhood, you’re invited to share our enthusiasm for fine fruit. Our Tastings are enjoyed by fruit experts, connoisseurs, and customers who simply want to taste and decide for themselves what varieties they like. 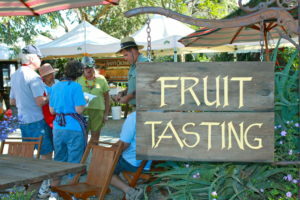 Our Tours consist of our farm stand, the store/museum, the orchard, and the packing and drying facilities. It will cover the history of fruit, history of agriculture in the Santa Clara Valley, fruit growing, marketing, & varieties. 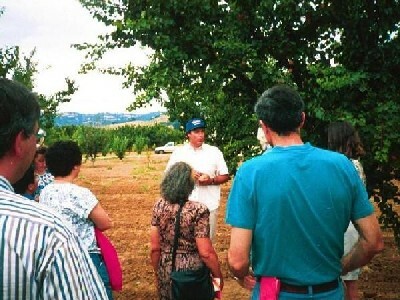 Your guide will lead you on your Harvest Walk through the orchard. You’re welcome to savor firsthand the various fruits that are ripe at the time. You’ll receive a bucket to pick your favorites. The bucket is then carried back to our farm stand for weighing and purchase (fruit is priced per pound). It is a really fun way for customers to partake of some of the finest and freshest fruits available anywhere.